It is difficult to reconcile a critical appraisal of the Apple Watch with the product’s commercial success. To examine the most popular watch in the world1 and find it wanting seems wrong; yet as Apple’s bombastic smartwatch kicks off its third year, its history implores ignominy. The integration of hardware and software is a keystone in Apple’s foundation. Every game-changing product they’ve released over the years has used this as a core advantage over the competition. Yet despite the Cupertino company’s proven track record, the last three years of Apple Watch have demonstrated a consistent struggle to get this right. Apple has certainly iterated on unsuccessful hardware and software ideas in the past, but never quite so publicly. The Apple Watch feels like a device that was rushed a little too early to market. Apple knew that it had something good, but it didn’t yet know which areas the device would really excel in. One of the most interesting pieces of this product’s story is that all signs point to Apple having gotten the hardware of the Apple Watch exactly right, at least in terms of its direction. The original Apple Watch was underpowered and lacking some technology that Apple simply couldn’t fit into it at the time, but the idea was there. In subsequent hardware iterations Apple has significantly increased the processing power, added vital new sensors, improved battery life, and shipped LTE. In this time the case design has remained unchanged (other than growing slightly thicker), and the input methods have persisted exactly. It may have taken until the latest Series 3 release for Apple to fulfill its initial vision for the Apple Watch hardware, but that vision has remained unshaken since the beginning. The same cannot be said for the Apple Watch software. Apple’s smartwatch operating system has had a rocky first few years. watchOS 1 was fundamentally broken in several ways, and probably should never have shipped. watchOS 2 was an attempt to shore up and replace the poor foundations under the hood, but it left the substandard user interface to fester in production for over a year. With last year’s release of watchOS 3, Apple took its best shot at rethinking cardinal pieces of that interface. watchOS 3 was a huge improvement over the blunders that came before it. As I wrote in my watchOS 3 review last year, Apple did great work with the update to cut away the excess and hone the OS to something simpler and more straightforward. It was a significant course correction which set a far better trajectory, but it didn’t get us all the way there. In a lot of ways it feels like watchOS 3 was the true watchOS 1. Where Apple left off with the smartwatch operating system last year was really the point where it should have started. Nothing was complete, but almost every piece felt primed for improvement rather than necessitating reinvention. In the wake of that update, Apple has been at a crossroads. With the foundations of watchOS finally feeling solid, Apple could either continue to drive the platform forward, or leave it on a slow-moving autopilot. Yesterday marked the release of watchOS 4 — our first opportunity to see the hope kindled by watchOS 3 borne out — and I’m pleased to report that Apple has succeeded in maintaining the platform’s momentum. Every area that this year’s update focuses on has seen fantastic improvements, and I’ve found myself interacting with my Apple Watch more than ever before. My only disappointment is that the scope of watchOS 4 isn’t quite as far-reaching as last year’s update. 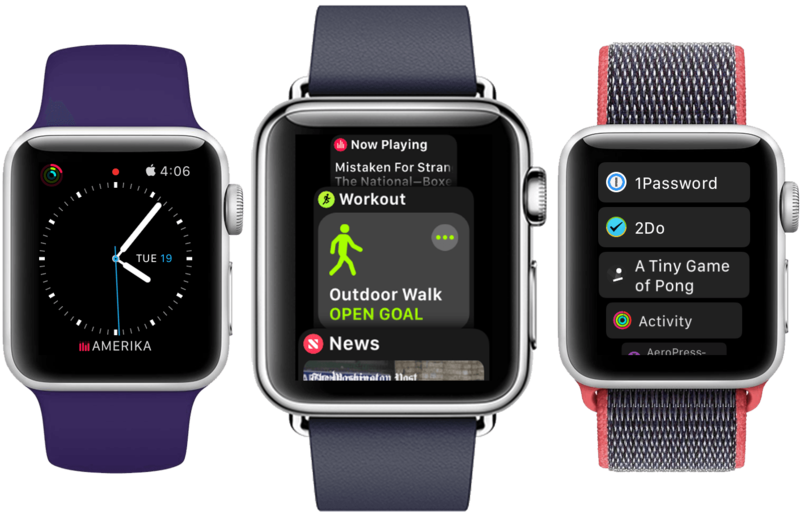 The big themes of watchOS 4 are fitness and music, and Apple has done some excellent work in these departments. New activity goals, completely overhauled Workout and Music apps, auto-launch of audio apps, a Now Playing Complication, and more are all excellent upgrades. As always there is still room for improvement, but many of these features are making the leap for the first time from options on my Apple Watch which I mostly ignore to real features which I find consistently useful in my daily life. There’s a lot to dig into here with the choices made and the new features added. Let’s dive in and find out what Apple has in store for the next year of Apple Watch. Apple’s concentration on fitness for watchOS 4 has produced a flood of interesting improvements to the related aspects of the operating system. I’ve never been a big fitness buff, but in testing these features I was taken by surprise by how effective they are. I’m still not a fitness buff by any definition of the term, but I truly have found myself thinking more about exercise in my daily life since installing watchOS 4. The new Activity goals and reminders have done their job by keeping me from forgetting that my Activity rings exist, and the speed and ease of starting a new workout have broken the barrier of being too much work for me to bother starting workouts when I am active. I recently moved from the very driving-centric town of Tucson, Arizona to the much more walking-centric town of Minneapolis, Minnesota. My lifestyle has been inherently a bit more active since the move than it was previously, so the new fitness features of watchOS 4 came at a convenient time for me. It’s hard to say whether I would have become as involved with them if I were still living in Tucson, but I was certainly continuing to ignore the fitness features of watchOS 3 for the first few months here before the watchOS 4 beta was released. If your lifestyle is not at all conducive to being active, I’m doubtful that these new features will be very impactful for you. They’re probably not going to inspire massive changes to the way you live. That said, if you’re on the border of starting to exercise, or if you’ve felt mostly ambivalent but not directly apposed to the Apple Watch’s fitness features in the past, watchOS 4’s new fitness improvements just might push you over the edge. Apple didn’t make significant changes to the Activity app itself in watchOS 4, but it did add a series of proactive notifications designed to help motivate you toward completing your activity goals or finishing your daily rings. The first of these notifications are for what Apple is calling “daily inspiration,” and they consist of a variety of different messages which keep you updated on the state of your long or short term activity goals. For instance, you may see a daily inspiration notification informing you that you’re only some number of days away from completing a new streak for one or all of your activity rings. It’s hard to pin down exactly how many variations of these proactive messages you could see, because they seem to be fairly random about picking metrics to try to motivate you for. Another example I’ve seen is a notification encouraging me to “make it happen today” when I failed to close all three of my rings the day before. The best news about these notifications is that they’re inconsistent. The exact frequency and composition is ambiguous because they’re generated by some sort of “AI” technique, and the end result is that I’ve never once felt annoyed by them being sent too often. Unlike the hourly “Time to Stand!” or frequent “Time to Breathe!” notifications, both of which I eventually had to turn off, daily inspiration notifications have been effective for me. The fact that they’re different every time helps to keep me interested in reading them and avoid getting sick of them. Another type of watchOS 4 activity notification is the “evening push.” These messages will pick one of your activity rings which you’re at least somewhat close to completing and let you know exactly what you need to do to finish it out. I’ve seen some of these recommending that I stand up a few more times by the end of the night, as well as a few mentioning specifics like “a brisk 15 minute walk will complete your Move ring for today.” Evening push notifications have more immediately actionable information than daily inspiration ones, but I often feel like they send too late at night. There’s no set schedule for these either (other than the general term “evening”), so I have no idea how they choose when to send, but it definitely varies pretty dramatically. Personally, when it’s 10:30 at night and my Watch tells me I need to go take a 40-minute walk to complete my Move ring, I tend to let that slide. If you’re more religious about completing your rings then maybe that’s information that you want to know no matter what time it is. Finally there are the “monthly challenge” notifications. These are rarer pop-ups which recommend or update you on a particular goal to pursue throughout the entire next month. If you successfully complete a monthly goal then you unlock a software achievement medal for that month in the Activity app on your iPhone. In my experience these have only come through about two or three times each month — first toward the beginning to set a monthly goal for me to pursue and then one or two times throughout the month to update me on my progress. If you’re someone who really centers their workout life around the Apple Watch then these prompts could certainly be a good way for you to find some new ideas for goals. For me these have been the least effective activity notifications. Overall, the new Activity notifications in watchOS 4 are designed with a clear goal in mind: making the Apple Watch’s activity tracking features a lifestyle. If you’re already someone who strictly pursues their Activity rings then these will be welcome additions. That said, I think these new notifications might end up having the greatest impact on people who are more on the fence about really getting into the habit of trying to complete those rings. My problem with the Apple Watch activity rings in the past is that I forgot about them throughout the day. For those who feel similarly, these new notifications can serve as a simple, low-friction way to keep activity in mind over time. Lastly, if your lifestyle just really doesn’t fit with Apple’s views on being active, or if you read the above and can’t imagine these notification being helpful, then you can turn some or all of them off in the Activity section of the Watch app on your iPhone.